This petition is addressed to the Mayor, Auckland Council, Auckland Transport, the Waitematā Local Board, Auckland City Centre Advisory Board, NZTA and the Ministers for Transport and Urban Development asking for the delivery of safer walking facilities for Auckland City Centre’s nearly 20,000 residents living in and around the Victoria Quarter (the area bounded by Victoria, Hobson and Union Streets). This highly urbanised area is dangerous and unpleasant for its many thousands of residents and visitors, especially the young and the old. The poor environment reflects an ongoing lack of care and interest in these residents' needs by all parties that this petition is addressed to. Please sign to support the residents of this growing inner-city community in having their basic safety and movement needs met. 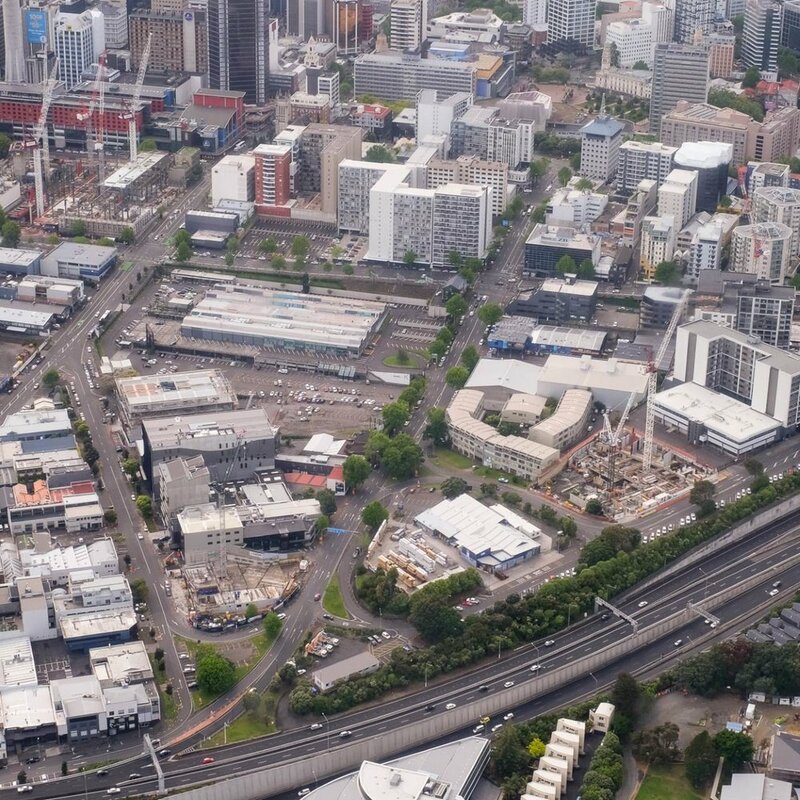 We request that all addressees respond to the Auckland City Centre Residents' Group to arrange a meeting to discuss how we can productively work at achieving these goals, including consultation with the various community groups effected by these issues. These improvements are not difficult to justify - this is by far the most densely populated place in New Zealand, and thus the per-capita benefit of any improvement is massively greater than anywhere else. Equally great is the moral imperative - more people live in the city centre than commute in by car. The Auckland City Centre population is 15 years ahead of population targets at nearly 50,000, with another 30,000 residents expected in the next 10 years. The majority of new residents are expected to settle to the west of Queen Street in the area known as Victoria Quarter, already home to over 18,000 people. The 2012 City Centre Masterplan identifies the needs of this burgeoning population in ‘Move 02 - EAST-WEST STITCH (Connecting the Western Edge of the City to the Centre)’, but even with the resident population now exceeding the number of commuters arriving by car, the built environment of Victoria Quarter remains extremely hostile and dangerous to pedestrians, prioritising car movements and their speed, above all else. Walking, cycling and transit make up the majority of movements for residents, but footpaths are often of poor quality and un-maintained, not meeting accessibility needs or design standards. Any safe, all-ages cycleways are largely targeted at long distance commuters heading to and from work, bypassing places that residents need to access for day to day activities (schools, parks, stores, neighbours, entertainment). Many intersections in Victoria Quarter require pedestrians to wait several minutes before allowing them to cross. Many intersections don’t even have crossings for pedestrians. Statistics and models will show that these streets are ‘safe’ due to a low volume of accidents and deaths, but this is a cynical and reductionist notion that is not a reflection of reality for residents and their children. Events such as The America’s Cup are warmly welcomed, but it is unclear how they benefit residents when a focus on the events may pull funding north towards the water, away from the places that desperately need them. A summary of just some of the issue with the area can be found here. 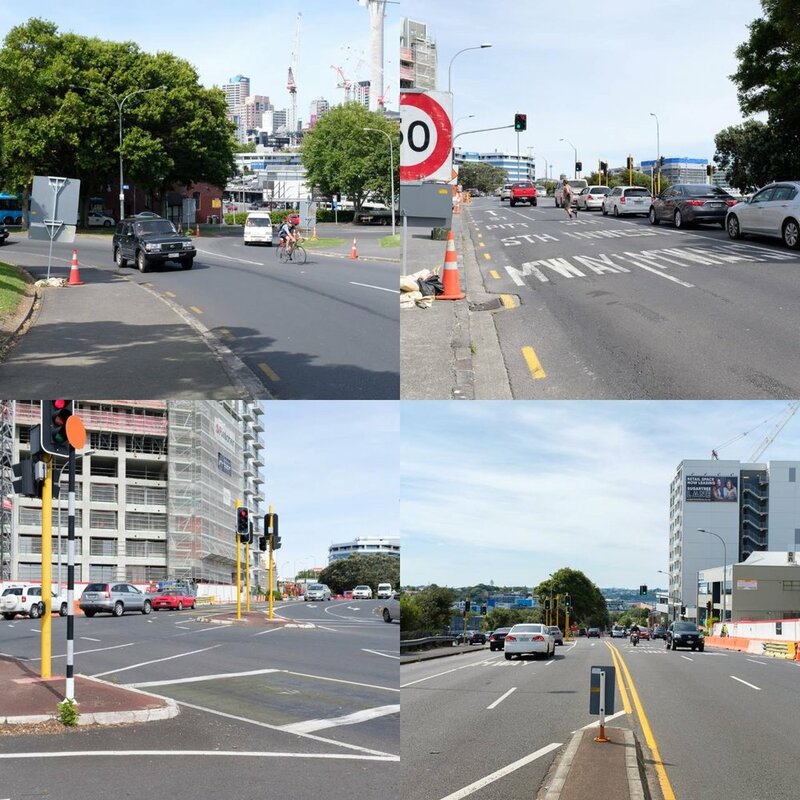 Almost all needs of residents of this area require traversing one or many dangerous streets and intersections that have been designed to accommodate car commuters rather than residents, with substandard footpaths and long waits to safely cross most streets. Union and Wellington Streets provide a barrier to parents and children attempting to access the Freemans Bay Primary School – the only Primary School near the City Centre. These streets are unsafe for children to use (supervised or not) and completely inappropriate in scale and design for a key (child) walking route. Low compliance with traffic signals by vehicles heightens this danger. Victoria Quarter, while providing some (growing) office space and hospitality amenity, is and will be largely residential, meaning that this population needs to leave the immediate area to do most day to day activities. Nelson and Hobson streets both impede pedestrian access from Victoria Quarter to the Queen Street Valley and on to the Learning Quarter (The University of Auckland and AUT University), with no planned cycle routes running east-west in the Southern City Centre. The lack of a western footpath on Nelson Street between Cook and Union Streets is not satisfactorily addressed by the existing Nelson Street Lane – it is a truly dire place, unwelcoming, and is poorly lit at night, and feels unsafe for nearby residents. 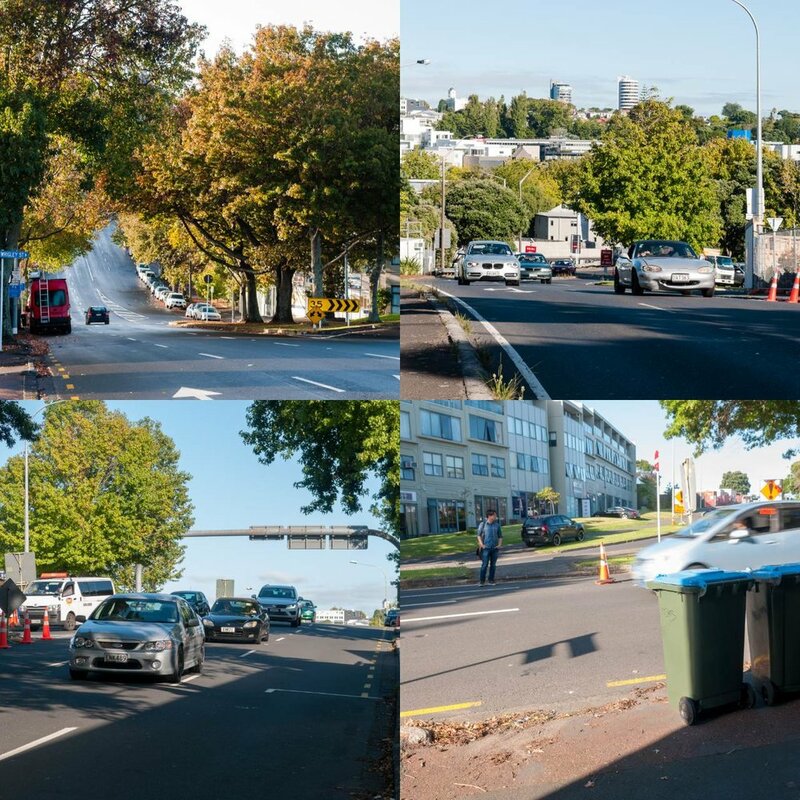 City Centre residents access to transport is limited by the many road barriers – the main bus networks running along Fanshaw, Wellesley and Hobson Streets and the future Aotea transport hub should all be easily accessible and convenient, but are the opposite. The current transit networks are oriented towards commuters, with no consideration for getting from one side of the city to the other. Access to Victoria Park, Western Park, Myers Park, Albert Park and the water’s edge are all made challenging and unsafe by either, Cook, Union and Nelson and Hobson Streets. The lack of any safe crossing on Cook Street prevents any direct access towards Victoria Park and Wynyard Quarter. The recent boom in population has also resulted in a precipitous drop in square meters of public and green space per capita, with no known plans to address this. Many public spaces are also regularly closed and privatised for commercial uses. The Victoria Street Linear Park is a welcome improvement for the City Centre, but is on the Northern periphery, and not likely to be useful for resident populations further south. The Wellesley Street Bus Boulevard is designed around bus mobility and it remains to be seen if the proposed design improves or worsens resident’s access across this corridor. Currently little more than a glorified motorway off-ramp, with wide lanes, high speeds, terrible footpaths and no safe pedestrian crossing. This street has plenty of width to allow improved footpaths, cycle lanes and a safe crossing in line with the desire-line down the hill to Victoria Park. The beautiful, mature trees mean that this could be an amazing street for people while still retaining the same traffic volumes and parking. This laneway is the main access to hundreds of homes, and is truly dire. Plans have been proposed for years, with no progress made. The poor state makes it a magnet for dumping and the poor lighting creates a perception of danger for residents. A high quality, well lit shared space would provide safe, pleasant access that shows that city centre residents have value, all without impacting vehicle access. Union Street, while fronting onto hundreds of homes, is nothing but a traffic sewer, used to pump cars onto the Wellington Street on-ramp and spaghetti junction. No consideration is made for families with children needing to access the nearby primary school, or just needing to get to work or buy groceries. Plenty of space means room for pedestrians and cyclists, with safe crossings provided for access to schools, parks, work and leisure. Nothing but a motorway off-ramp, with no hope in sight. Uneven, dangerous footpaths, long pedestrian crossings hundreds of meters apart. Noisy, polluted and dangerous. Potential and unrealised plans for a true boulevard made for all users, including the residents living immediately on it - not just those arriving by city by car. A quiet street, with wide traffic lanes, excessive levels of parking and compromised, in-accessible footpaths. There is enough width to retain all traffic movements and parking while fitting in more trees, more space for pedestrians, cycle lanes and space for cafes to open out onto the footpaths. A place for people, not for parking. With Support from the Auckland City Centre Residents' Group. Auckland Design Office. (2017). Auckland City Centre: Summary Sheets.